Here in the U.S., we only get access to the tip of the noodle iceberg. It's a sad state of affairs for noodle lovers like myself. Even in San Francisco, the noodle dishes we can easily find numbers at about a dozen: pho, wonton noodle soup, ramen, spicy beef noodles...the greatest hits, if you will. If you want to explore further, say, sip some bun bo hue, or savor a bowl of laksa, you need to hunt those treasures out. And some dishes, like the following spicy chicken noodle soup, are simply unavailable no matter how hard you look. But let's say you're a true fanatic, and you just have to get your spicy chicken noodle fix. Well then, clear your calendar, because these noodles take two weeks to make. Just kidding. Sort of. It takes about half an hour of work to make this dish, but you will need to wait two weeks for the chilis to cure. Is it worth it? To borrow a word, abso-f*cking-lutely. The steamed chicken is tender and flavorful, with just the faintest fragrant hit of rice wine, and the ruby-red chilies infuse the broth with a scalding heat that's at the teasing edge of discomfort. Though the ingredients are deceptively simple, the results are unlike any noodle soup I've ever eaten, and that's saying something. I was craving the bland, slightly sweet crunch of slivered bamboo shoots in this dish, but the original version does not include them. This makes enough for two bowls of noodles. 2 big handfuls of fresh, washed vegetables (I used pea sprouts, but spinach, baby bok choy, or almost any green veggie would work). 1. Fill a medium-sized pot about halfway with water and bring to a boil. Cut the chicken into bite-sized chunks. Blanch the chicken briefly (just until the water returns to a boil, which should be under a minute). Drain. 2. 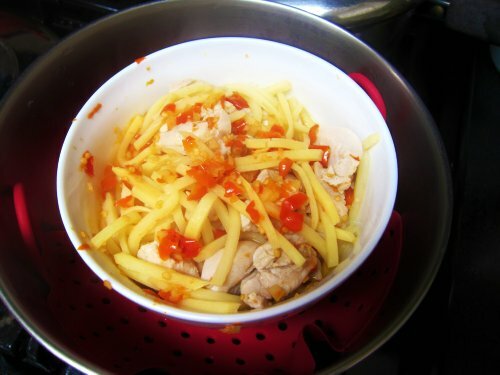 Mix the chicken, ginger, rice wine, chilies, and bamboo shoots in a heatproof bowl. Add about an inch of water into the pot you used to blanch the chicken and place a collapsible or silicone steamer inside the pot. Balance the bowl on top of the steamer and cover the pot with a tight-fitting lid. 3. Steam chicken over high heat for about 20 minutes, until it is entirely cooked through. 4. Meanwhile, in a separate pot, heat your broth. Fill yet another pot with water (this is not a dish for those without dishwashers) and bring to a boil. Cook your noodles according to package instructions. In the last 30 seconds or so, add your veggies to blanch them. 5. 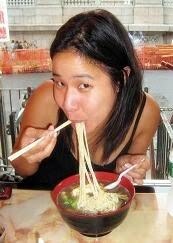 To assemble each bowl: Place a bundle of noodles in the bottom of the bowl. Top with chicken-chili mixture and blanched vegetables. Ladle broth on top. I happened to have a bunch of leftover Thai red chilis lying around from a homemade sriracha making experiment, and this was the perfect way to keep them from going to waste. You can use milder chilis if you prefer. For more ideas about what to do with these, see how Sea Salt With Food uses them. 1. Take a pound of fresh red chilis. Wash and dry them very well. 2. Chop the chilis into small pieces and place them in a bowl. Add 3½ tablespoons of kosher salt. Mix well. 3. 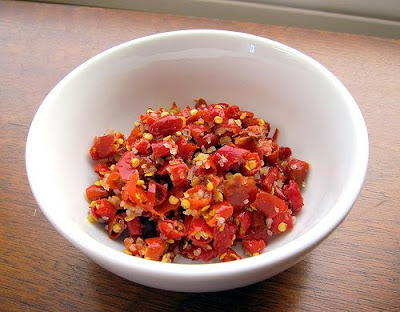 Place the chili-salt mixture in an airtight container and add another ½ tablespoon of salt in a thin layer on top. Seal the container and store in a dark, cool place for a couple of weeks. Once opened, store the container in the refrigerator, where the chilis will keep for months. Yum! 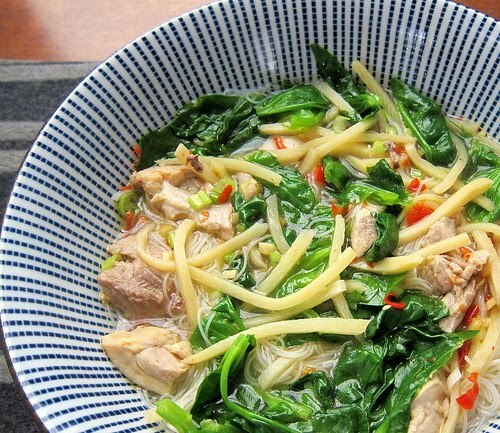 I combined this recipe with the other chinese chicken noodle soup you posted - added the mushrooms at the end and added a little soy sauce and sesame oil to the chicken mixture before I steamed (since I didn't have the salted chilis). I also used chili garlic sauce as a substitute in a pinch. hope that's not blasphemy!